"It died three times, and was reborn twice." 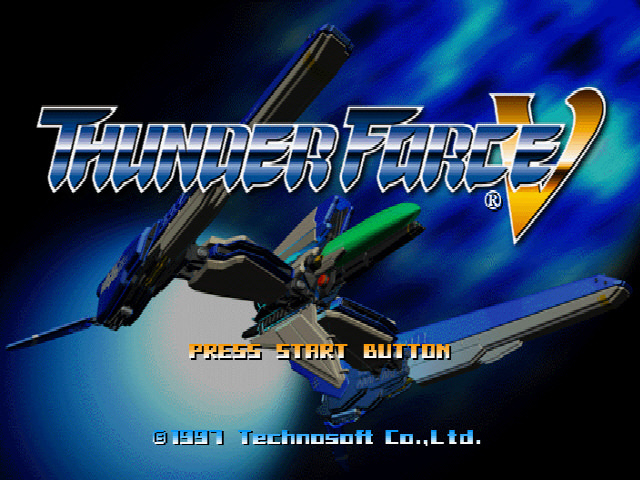 Technosoft's swan song to the venerable Thunder Force series. Not as polished as their 16-bit entries, but not without its own charm! Rules: 1 Credit. Note your version, difficulty, ship selection (when playing the PS1 port), and route. I will put them in the appropriate table. If you make it to the final boss but get the bad ending, or fail to kill it in time, use ALL, like in the game. If you defeat the TLB use ALL!, like in the game. If there is interest for the time attack mode (either version! SS still logs your time, even if it lacks PS1's dedicated mode), I will make a table for that as well. Could be a neat challenge. NOTE: Master Difficulty is unlocked by beating the game on Hard. Also NOTE: Play the game on Master, folks. It's a lot better that way. Last edited by EmperorIng on Fri May 04, 2018 3:22 pm, edited 1 time in total. I've been playing this again recently, to wash the bitter taste of overly-difficulty shootemups out of my mouth. Been having some fun, outside those few stretches where you sit still, hold fire, and watch the stage go by (hello, stage 4!). Part of all this effort was to unlock Master difficulty, and it's worth it. I hope to try for at least one Master ALL! clear for Thunder Force V before I really consider myself satisfied. What's the situation on the Japanese and American releases of the PS1 version? Thanks! I try to put a little effort into my score threads (see: Soukyugurentai* ). Good catch on the PS1 versions; I had forgotten about it. I suppose on the old thread the PS1 scores were exclusively the WD release. Here if someone were to post with the Japanese PS1 release I think I'd make a new table for it, because the scores would not be compatible - Working Designs added an extra multiplier to the Free Range weapon, which makes it a totally different beast than the Technosoft original. In the WD port, you can get an additional multiplier to your kill depending on the proximity of your attack. This goes up to 3x (for each "range" on Free Range). Ostensibly, this means you can get up to 3x(16x) on an enemy, or 48x its score value. I don't know if the Japanese PS1 game is identical to the Saturn, but I think it's likely, outside of the extra ships. 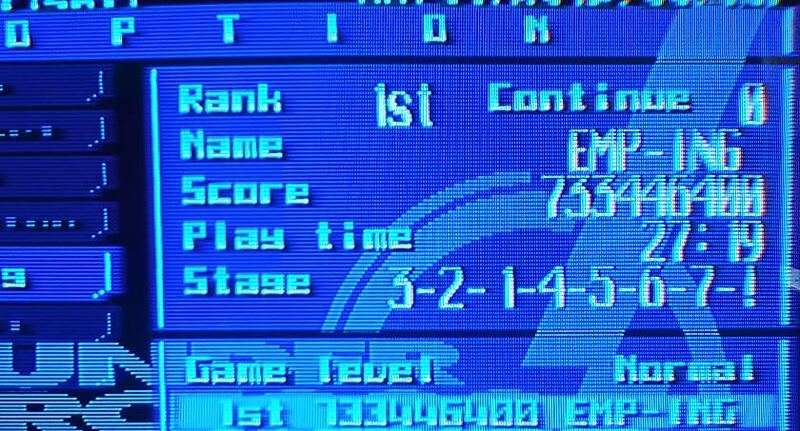 Interestingly, it looks like Working Designs made it harder, if not almost impossible, to get a "perfect score" (every possible point earned) than it is on the Saturn original - I think by upping the score counter to add for their $10,000 contest gimmick. Right, I always figured the Japanese PS1 release was more or less a revised Saturn release. I'm not sure how to feel about the changes. A good idea for its own game, but grafting it onto an existing game seems like a questionable idea. Better to make a different game than a slightly worse one though, like WD did with Ray Storm. WD is usually pretty good about changes but the contests they had for shmups lead to some dumb things. The Playstation Version DOES max out at 1,103,999,995!!!! I am living proof of rhis. There is a “Score Milking Area” in the game where you are able to sit and just destroy stuff until you are satisfied. You also MUST get perfect “End Game Bonus” to het it, which you MUST have at least 1 hit on your shield for a perfect weapon bonus. It tales 3hrs to do this. The FINAL play for the contest was only for 2nd through 5th place. When you max the score out, that’s wjat happens. "AREA GUARD NAME, GUARDIANS KNIGHT--SUB-NAME--"FOR WHOM IS THE SWORD DRAWN?!" Hi ! First, Congratulations for your Masters high scores ! My high score on time attack mode ( difficulty Normal ) : around 802 000 000 points. First, Congratulations for your performances at Thunder Force V.
I have a question : Please, How to have the Evasion Bonus at tf5 on PS1. Thanks a lot for an answer.
" May fortune be with you... "